This article is about the fictional character. For the comic book series, see Star Wars: Poe Dameron. Poe Dameron is a fictional character in the Star Wars franchise. Introduced in the 2015 film Star Wars: The Force Awakens, he is portrayed by Oscar Isaac. Poe is an X-wing fighter pilot for the Resistance who inadvertently brings renegade stormtrooper Finn (John Boyega) and Jakku scavenger Rey (Daisy Ridley) into battle against the sinister First Order. He is featured in The Force Awakens media and merchandising as well as an eponymous comic book series and the December 2017 sequel, Star Wars: The Last Jedi. Isaac and the character have received positive reviews, with Poe being compared to the characterization of Han Solo (Harrison Ford) in the original Star Wars film trilogy. During the development phase of The Force Awakens, the character was initially referred to as "John Doe" and was first intended to be Jedi-like, and then a bounty hunter with a Wookiee sidekick. Isaac's casting in the film was first announced on April 29, 2014. His character was first seen in the 88-second The Force Awakens teaser trailer released by Lucasfilm on November 28, 2014, piloting an X-wing fighter. The name Poe Dameron was revealed by Entertainment Weekly in a Lucasfilm-designed Topps-style trading card mockup in December 2014. The character was one of those featured in a May 2015 Vanity Fair photo shoot by Annie Leibovitz. He was named after The Force Awakens writer/director J. J. Abrams' assistant Morgan Dameron. The film has received praise for its diverse casting, including Isaac, who is Guatemalan-American. Peter Travers of Rolling Stone wrote that "giving starring roles to a black man, a white woman and a Latino is ... quietly history making". Targeted at Spanish-speaking viewers, an action-oriented Univision TV spot heavily featuring Poe included an introduction by Isaac in Spanish. After an initial release of promotional character posters in November 2015, a poster featuring Isaac's Poe was released the following month. In The Force Awakens, Poe is a skilled X-wing fighter pilot for the Resistance. The son of Rebel Alliance fighters, he is a commander in the Resistance’s Starfighter Corps and "one of Leia Organa's most-trusted operatives" who is headstrong and "can fly anything". Isaac described Poe as "the best freaking pilot in the galaxy... He's been sent on a mission by a certain princess, and he ends up coming up across [Finn], and their fates are forever intertwined." Natalie Zutter and Chris Lough of Tor.com wrote, "Poe is that rare creature who knows exactly what he wants to do with his life." Isaac said of the character in 2015, "Poe's the kind of guy you want in the trenches with you. He’s straightforward, he’s honest, he's incredibly loyal and he’s got some swagger to him." Katy Waldman wrote for Slate, "This is Poe Dameron, star pilot, heartthrob, wiseass, ace leather jacket–bestower, Finn’s OTP. When he grins up at [Kylo Ren], all rakish charm and derring-do, we know the movie will be OK." Comic book writer Charles Soule, creator of the 2015 Marvel Comics series Star Wars: Poe Dameron, said of the character, "I think it's his charisma that really defines him, for me. Poe Dameron is one charming fellow. We've seen great pilots before, and great warriors, but his ability to lead and inspire feels pretty fresh to me, as is his somewhat snappy roguishness." Poe is in some ways a surrogate son for Leia. But also I think she sees in him the potential for a truly great leader of the Resistance and beyond ... Poe's arc is one of evolving from a heroic soldier to a seasoned leader, to see beyond the single-mindedness of winning the battle to the larger picture of the future of the galaxy. [Leia], with tough love, wants to push Poe to be more than the badass pilot, to temper his heroic impulses with wisdom and clarity. Poe's helmet on display at Star Wars Launch Bay at Disney's Hollywood Studios (2015). Poe Dameron is the decorated star pilot of General Leia Organa's Resistance fleet, and the robot BB-8 is his astromech droid. He is sent by Leia on a mission to the planet Jakku to retrieve part of a map that will lead to the location of her brother, Luke Skywalker. Before Poe can leave with the map, the First Order attacks and he is captured. The pilot has entrusted the map to BB-8, who flees into the desert as Kylo Ren tortures Poe in search of the map. Poe is saved by the renegade stormtrooper Finn, and they escape in a TIE fighter. They crash on Jakku; Finn is ejected from the ship and Poe is presumed dead as the destroyed craft is sucked under the sand. Poe later reappears, having also been thrown from the crash, now leading a squadron of X-wing pilots in an assault on the First Order at Maz Kanata's castle. He later leads his squadron to attack the First Order's Starkiller Base, and personally fires the shots that cause the superweapon to explode. Isaac told GQ in December 2015 that when he was offered the role, Abrams told him that Poe would die in the film. When Isaac later accepted, Abrams said he had changed his mind: "I’ve figured it out. You’re in the whole movie now." Comedic lines, like those during Poe's interrogation by Kylo Ren, were added in reshoots, and some were improvised by Isaac. The 2015 novelization of The Force Awakens by Alan Dean Foster explains that Poe regains consciousness and is able to crash land the TIE fighter in the desert. Thrown from the wreckage, he comes upon the Blarina scavenger Naka Iit. Poe helps Naka outrun a team of pirates, and in turn Naka helps Poe get to Blowback Town. Poe also appears in the Journey to Star Wars: The Force Awakens line of novels and comic books, introduced in conjunction with The Force Awakens to connect the film with previous installments. He is first mentioned in the young adult novel Moving Target: A Princess Leia Adventure (2015) by Cecil Castellucci and Jason Fry, set between The Empire Strikes Back (1980) and Return of the Jedi (1983). Yavin 4, the moon on which the Rebel base was located in the 1977 film Star Wars, was established as Poe's homeworld in the comic series Star Wars: Shattered Empire (2015) after the Guatemalan-born Isaac learned that the shooting location for Yavin 4 had been Tikal, Guatemala. The Shattered Empire series features Poe's parents, members of the Rebel Alliance: his mother is Shara Bey, an A-wing pilot who adventures with Leia, and his father is Kes Dameron, part of a special ground force known as the Pathfinders who are led by Han Solo. Poe is featured in Star Wars: Before the Awakening (2015) by Greg Rucka, an anthology book for young readers about the lives of Poe, Rey and Finn before the events of The Force Awakens. Poe is also a point of view character in the 2015 novelization of The Force Awakens by Alan Dean Foster. A Marvel comic book series titled Star Wars: Poe Dameron, written by Charles Soule and illustrated by Phil Noto, began publication in April 2016. The events of the series take place shortly before The Force Awakens. Poe is a playable character in the 2015 Force Awakens add-on to the Disney Infinity 3.0 video game, with an Infinity character figurine available separately. Hasbro has released a 3.75 inch Poe Dameron action figure, and a 6 inch figure in their Black Series line. Funko has produced three Poe Dameron figures as part of their POP! Television line of 4.5 inch vinyl figures in the Japanese super deformed style. The first features the character in his flight suit, helmet, and goggles; the second is a Hot Topic-exclusive version in Poe's leather jacket look from the beginning of the film; and a third is an f.y.e.-exclusive version in an orange First Order "prisoner suit" and facial cut. Poe and BB-8 are featured in a Lego Star Wars playset called Poe's X-wing Fighter, and Poe is available as a Lego Buildable Figure. The Lego versions of Poe and BB-8 also appear in the 2016 short form animated series Lego Star Wars: The Resistance Rises, voiced by Lex Lang, and the short Poe Dameron vs the First Order Snowspeeder. Hasbro released a wearable replica of Poe's helmet as part of its Star Wars: The Black Series line in 2017. Shortly after the destruction of Starkiller Base, the Resistance evacuates their base on D'Qar as the First Order closes in. Poe leads a counterattack on the First Order to give the last Resistance fighters more time board the transports. When they do so, Leia orders Poe to pull back, but he insists that they seize the opportunity to destroy one of the First Order's Dreadnoughts, and calls in a team of bombers. While they are successful in taking out the ship, all of the bombers are destroyed and their crews killed, and Leia demotes Poe to captain for his recklessness and unwillingness to follow orders. The First Order soon attacks again, having tracked the Resistance through lightspeed, a feat previously believed to have been impossible. The attack claims the lives of nearly all of the Resistance's leadership and renders Leia unconscious. While Poe assumes that he will become the acting general, Leia is instead replaced by Vice Admiral Holdo, who dismisses his suggestions due to his earlier reckless actions. Poe concocts a plan with Finn and mechanic Rose Tico to disable the First Order's tracker from within their lead Star Destroyer, but keeps the operation a secret from Holdo. Discovering that Holdo's plan is to have the Resistance forces abandon their vulnerable cruiser, Poe stages a mutiny. Finn, Rose, and BB-8 fail to disable the tracker, and an awakened Leia stops Poe's mutiny and resumes command though both Leia and Holdo express respect for Poe's daring. Leia later reveals to Poe that Holdo's plan was always to use the cruiser to draw the First Order off while the transports escaped undetected. The transports take the Resistance forces to an abandoned base on the planet Crait, where they transmit a distress signal to their allies. Poe leads an offensive against the invading First Order, but is unable to stop their assault. As Luke Skywalker faces off against Kylo Ren, Poe leads the remaining members of the Resistance to escape through an uncharted passage. He is among those who flee with Rey on the Millennium Falcon. In an early version of the script, Poe accompanies Finn to Canto Bight, but writer/director Rian Johnson found the storyline flat when he realized their dialogue was interchangeable. This led to the creation of the character Rose Tico, who would challenge and contrast with Finn. Poe appears in the 2018 animated TV series Star Wars Resistance, voiced by Isaac. The character and Isaac's performance have received positive reviews. Michael Phillips of the Chicago Tribune wrote, "Oscar Isaac is a primary asset as Poe Dameron ... Like Ford's Han Solo in the original three, he's the guy you want on your team, the one who doesn't take any guff". Robbie Collin of The Telegraph called Poe "a dashing, dry-humoured swashbuckler—in short, he’s like Han Solo was 40 years ago". Todd McCarthy of The Hollywood Reporter described the "hotshot" pilot as "a man very much in the Solo mold", and Manohla Dargis of The New York Times wrote that Poe "suggests a next-generation Han". Richard Roeper of the Chicago Sun-Times noted that "Isaac has more than a bit of Han Solo swagger", and Ann Hornaday of The Washington Post said that "Isaac brings just the right amount of cocksure street smarts to his role". Brian Hiatt of Rolling Stone wrote that Poe's "loose, jazzy dialogue was the first, highly welcome clue that these new films would be more human in tone than George Lucas' prequels." The Telegraph also listed Poe's scenes as one of their "14 things Star Wars fans will love about The Force Awakens", writing that they "spark and fizz with energy" and that "while Han Solo will always hold the number one spot, Oscar Isaac’s Poe Dameron is definitely a serious contender for the title of Second Coolest Man in the Galaxy". Peter Travers of Rolling Stone wrote that "Isaac oozes flyboy charm". Alex Brown of Tor.com called Poe "the greatest addition to Star Wars canon since Mara Jade", a popular character from the Star Wars expanded universe. Both Joanna Robinson of Vanity Fair and Scott Mendelson of Forbes noted the chemistry between Poe and Finn (John Boyega), with Brian Truitt of USA Today calling the relationship a "bromance". Their scenes in the film, and Isaac's own comments during an interview with Ellen DeGeneres, have sparked fan and journalistic speculation that Poe could be gay, or be developed as such in future films. Several media outlets reported the wave of fan fiction and fan art created by fan "shippers", or those with a desire to see Poe and Finn in a romantic relationship. Commenting on Isaac's camaraderie with his The Force Awakens cast members, Joanna Robinson of Vanity Fair wrote that "the most important bond Isaac established was with John Boyega. Theirs is a flirtation that launched a thousand pieces of fan fiction." ^ Sciretta, Peter (December 28, 2015). "How Force Awakens Changed During Development: Jedi Killers, Force Ghosts and The Doom Star". /Film. Retrieved December 28, 2015. ^ "Watch the Incredible Star Wars: The Force Awakens Trailer". Rolling Stone. November 28, 2014. Retrieved January 1, 2016. ^ Kain, Erik (November 29, 2014). "5 Reasons The New Star Wars Trailer Was The Perfect First Look At The Force Awakens". Forbes. Retrieved January 1, 2016. ^ Ahmed, Tufayel (November 28, 2014). "Star Wars The Force Awakens trailer: 5 things we've learned from the EPIC Episode VII trailer". Daily Mirror. Retrieved January 1, 2016. ^ Gilman, Greg (November 29, 2014). "Star Wars: Episode VII – The Force Awakens Trailer Unmasks a Stormtrooper, Teases Villain". TheWrap. Retrieved January 1, 2016. ^ White, James (December 3, 2015). "J.J. Abrams' assistant reveals how Poe Dameron took her name". Empire. Retrieved December 20, 2015. ^ Rico, Jack (April 24, 2015). 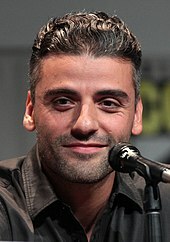 "Pop Latino: Oscar Isaac Gives Hispanics A Presence in Star Wars". NBC News. Retrieved December 28, 2015. ^ Keegan, Rebecca (December 21, 2015). "Star Wars: The Force Awakens reflects our diverse, modern world". Los Angeles Times. Retrieved December 28, 2015. ^ Bastién, Angelica Jade (December 26, 2015). "The Case Against Colorblind Casting". The Atlantic. Retrieved December 28, 2015. ^ a b Travers, Peter (December 16, 2015). "Star Wars: The Force Awakens". Rolling Stone. Retrieved December 21, 2015. ^ Vanderbilt, Mike (December 10, 2015). "Poe Dameron and dogfights make two new Force Awakens ads worth watching". The A.V. Club. Retrieved December 22, 2015. ^ Moore, Trent (November 4, 2015). "See Han, Leia, and the new kids on the block in 5 new Star Wars: The Force Awakens posters". Blastr. Retrieved December 28, 2015. ^ Caron, Nathalie (December 7, 2015). "Image of the Day: Poe Dameron finally gets his own Star Wars: The Force Awakens poster". Blastr. Retrieved December 28, 2015. ^ a b Abrams, Natalie (April 16, 2015). "10 things we learned from the Star Wars: The Force Awakens panel". Entertainment Weekly. Retrieved May 23, 2015. ^ a b "Databank: Poe Dameron". StarWars.com. Retrieved December 20, 2015. ^ Zutter, Natalie; Lough, Chris (December 21, 2015). "What We Learned About the Star Wars Universe From The Force Awakens". Tor.com. Retrieved January 1, 2016. ^ a b c Truitt, Brian (December 20, 2015). "Oscar Isaac hops in the cockpit for Star Wars". USA Today. Retrieved January 1, 2016. ^ Waldman, Katy (December 23, 2015). "When did you first fall in love with Oscar Isaac?". Slate. Retrieved January 1, 2016. ^ Richards, Dave (February 29, 2016). "Soule & Noto Fill In Poe Dameron's Pre-Star Wars: The Force Awakens History". Comic Book Resources. Retrieved July 28, 2016. ^ Breznican, Anthony (August 10, 2017). "In Her Final Role, Carrie Fisher Restores Hope for Leia Organa". Entertainment Weekly. Retrieved August 17, 2017. ^ Martin, Brett (December 19, 2015). "Star Wars Actor Reveals Which Character Was Supposed to Die in The Force Awakens". GQ. Retrieved December 21, 2015. ^ a b Hiatt, Brian (May 18, 2016). "Oscar Isaac: The Internet's Boyfriend Becomes a Leading Man". Rolling Stone. Retrieved March 16, 2017. ^ a b c Foster, Alan Dean (2015). "Chapter X". The Force Awakens (e-book). ISBN 9781101965504. ^ a b Saavedra, John (December 17, 2015). "Star Wars: The Force Awakens Easter Eggs and Reference Guide (Poe Dameron)". Den of Geek. Retrieved December 18, 2015. ^ Lussier, Germain (December 7, 2015). "Here's How The Force Awakens' Resistance Differs From the Rebellion". io9. Retrieved December 7, 2015. ^ "A Galaxy of Star Wars: The Force Awakens Books Coming December 18". StarWars.com. December 1, 2015. Retrieved December 21, 2015. ^ Foster (2015). "Chapter I". The Force Awakens. ^ a b Truitt, Brian (January 17, 2016). "Exclusive: Star Wars: Poe Dameron comic book debuts in April". USA Today. Retrieved February 15, 2016. ^ Schedeen, Jesse (April 5, 2016). "Star Wars: Poe Dameron #1 Review". IGN. Retrieved July 28, 2016. ^ "Star Wars: The Force Awakens Play Set for Disney Infinity 3.0 Edition Now Available". StarWars.com. December 18, 2015. Retrieved December 22, 2015. ^ Truitt, Brian (December 16, 2015). "Infinity adds to Force Awakens experience". USA Today. Retrieved December 22, 2015. ^ Spry, Jeff (August 14, 2015). "Leaked peek at Hasbro's Kylo Ren, Captain Phasma and 10 more The Force Awakens action figures". Blastr. Retrieved January 3, 2016. ^ Myatt, D. Martin. "Poe Dameron from Hasbro's The Force Awakens Collection". Rebelscum.com. Retrieved January 3, 2016. ^ Myatt, D. Martin. "07 Poe Dameron from Hasbro's The Black Series". Rebelscum.com. Retrieved January 3, 2016. ^ "The Funko Awakens in Our Star Wars Pop Giveaway". ComicsAlliance. September 21, 2015. Retrieved March 16, 2017. ^ Deen, Sarah (January 7, 2016). "13 awesome gifts for the Poe Dameron fan in your life". Metro.co.uk. Retrieved March 16, 2017. ^ a b Ferme, Antonio (May 6, 2016). "More Star Wars: Force Awakens Funko POPs Revealed!". Moviepilot. Archived from the original on 2017-03-17. Retrieved March 16, 2017. ^ a b Burks, Robin (May 6, 2016). "Funko To Release New Line of Star Wars: The Force Awakens Pop Figures". Tech Times. Retrieved March 16, 2017. ^ "Minifigs: sw658: Poe Dameron (75102)". Brickset.com. 2016. Retrieved January 13, 2016. ^ "75115-1: Poe Dameron". Brickset.com. 2015. Retrieved January 1, 2016. ^ "2016 Speakers: Lex Lang". Kawaii Kon. Retrieved November 13, 2016. ^ "Credits: Animation". LexLang.com. Retrieved September 22, 2016. ^ Sciretta, Peter (February 17, 2017). "Cool Stuff: Star Wars, Guardians of the Galaxy, Stranger Things, Elm Street, Batman, Planet of the Apes". /Film. Retrieved March 16, 2017. ^ Szostak, Phil. The Art of Star Wars: The Last Jedi. Abrams Books. p. 111. ISBN 9781419727054. ^ Phillips, Michael (December 16, 2015). "Star Wars: The Force Awakens review: A return to the original, in all the right ways". Chicago Tribune. Retrieved January 2, 2016. ^ Collin, Robbie (December 18, 2015). "Star Wars: The Force Awakens review: 'the magic is back'". The Telegraph. Retrieved December 29, 2015. ^ Dargis, Manohla (December 16, 2015). "Star Wars: The Force Awakens Delivers the Thrills, With a Touch of Humanity". The New York Times. Retrieved January 2, 2016. ^ "14 things Star Wars fans will love about The Force Awakens". The Telegraph. December 17, 2015. Retrieved December 29, 2015. ^ a b c d Robinson, Joanna (December 25, 2015). "Watch Oscar Isaac Charm the Pants off Every Single Star Wars: The Force Awakens Cast Member". Vanity Fair. Retrieved December 29, 2015. ^ a b Mendelson, Scott (December 15, 2015). "Star Wars: The Force Awakens Review: The Empire Strikes Out". Forbes. Retrieved December 16, 2015. ^ a b c Truitt, Brian (December 24, 2015). "The Poe/Finn Star Wars bromance has taken over the Internet". USA Today. Retrieved February 18, 2016. ^ Fisher, Natalie (December 24, 2015). "Is Star Wars setting up Poe Dameron as its first queer protagonist?". Hypable. Retrieved December 29, 2015. ^ a b Roth, Madeline (December 21, 2015). "This Is The Star Wars Couple Everyone's Shipping (Hint: It's Not Rey And Finn)". MTV News. Retrieved December 29, 2015. ^ a b Boboltz, Sara (January 6, 2016). "Why Some Star Wars Fans Think These Two Characters Are Gay". The Huffington Post. Retrieved June 29, 2016. ^ a b Carr, Jack (December 29, 2015). "After 7 Movies, Star Wars Quietly Sets Up Its First Gay Relationship (And The Internet is Loving It)". Moviepilot. Archived from the original on 2016-01-12. Retrieved December 29, 2015.